When it comes to transferring photos from iPhone to external hard drive, there are a lot of things that you need to think about and discover accordingly. To help you make life simpler, though, this guide can assist. Can I Transfer Photos from iPhone to External Hard Drive? Yes! When it comes to getting plenty of movement carried out, then, you want to understand the easiest plan to backup iPhone photos to external hard drive sources. Here are three of the simplest, most effective solutions you can utilize. This takes just three simple steps, and is pretty easy to carry out. One of the easiest ways to transfer photos from iPhone to external hard drive is to look at a software kit known as iMyFone TunesMate, an iPhone transfer tool. 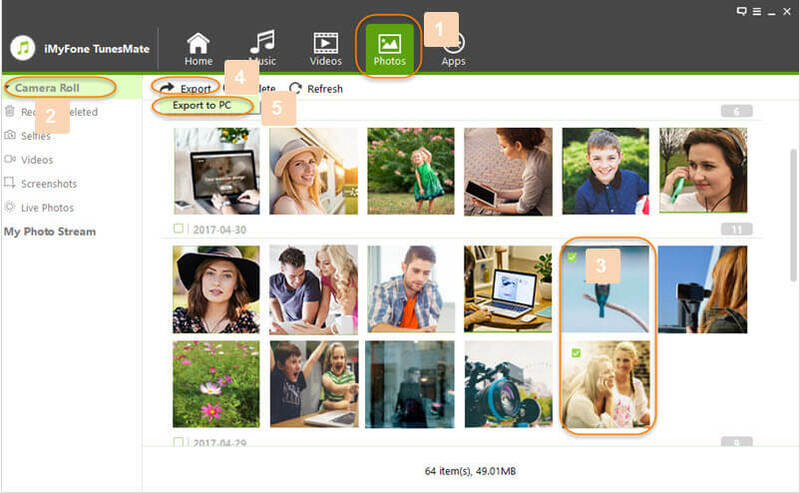 With its free trial, you can backup photos directly from iPhone to external hard drive/computer (as easy as drag-and-drop) and delete unwanted photos in bulk. TunesMate supports to transfer photos, albums, music, playlists, ringtones, movies, podcasts, audiobooks, TV shows, iTunes U, etc. from iPhone to external hard drive. Backup photos/albums (not just photos) from iPhone to external hard drive or computer (camera roll and photo stream are inclusive). Two-Way Transfer - You can transfer files from iPhone to computer, and from computer to iPhone freely. Free Deletion - You can delete unwanted photos, music, videos, playlists in bulk for free. Add Files without Data Loss - When adding files to iPhone, the old files on iPhone will be well-remained. No data will be lost. Share Music/Movies - You can share music and movies (paid and free) to friends within different Apple IDs. It may be the cheapest transfer software in market, as there is an official coupon code(5ED-FQ1-KZU) for you. Click here to know how to use the Coupon code. Step 1: Start off by launching iMyFone TunesMate, connecting it to your iPhone and your external hard drive. 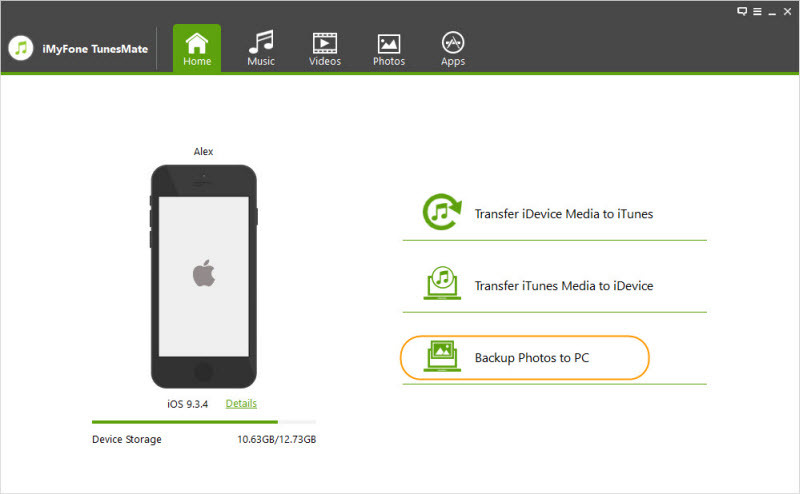 Step 2: Then, you can turn to Backup Photos to PC/Mac from the home interface and click on it. 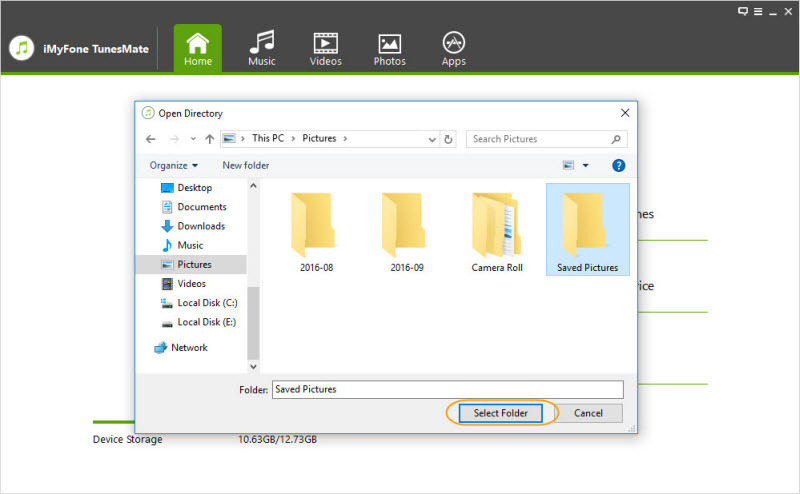 Step 3: Select your external hard drive from the pop-up window and hit "Select Folder" to begin transfer. Step 1: Connect your iPhone and external hard drive to computer and launch iMyFone TunesMate. Step 2: Go to Photos tab from the top menu and you will be in the Camera Roll window. All the photos will be dispalyed at the right panel and the albums will be shown at the left sidebar. 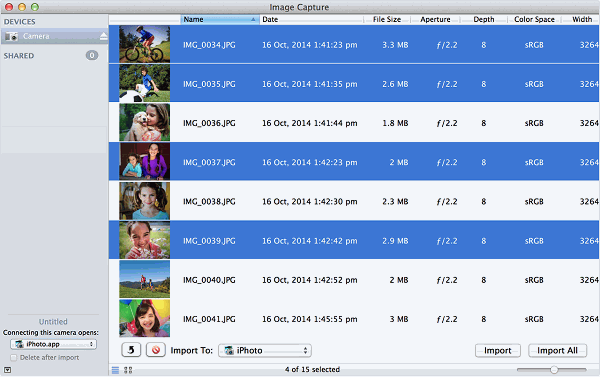 To Transfer Photos: Select the photos and hit Export > Export to PC/Mac. Browse your external hard drive for the transferred photos. To Transfer Albums: Right click on the specific album from the left sidebar and select Export to PC/Mac. Now, you could also turn to using the iCloud drive to ensure that you are using the ‘official source’ – now, that might make sense, but it’s not always necessary or even recommended to. To help you make this easier, you just need to transfer photos from iPhone to external hard drives by using the iCloud feature. Step 1: Make sure you turn on iCloud Photo Library from Settings > iCloud > Photos on iPhone. Step 2: On your computer, download the iCloud program or go to iCloud.com and log in with your Apple ID. Step 4: Tap Download selected items from the top right bar. It might need a few minutes if there are a lots of photos to transfer. Step 5: Plug in your external hard drive and open it. Step 6: Find the photos downloaded on computer and copy them to the external drive. However, please keep in mind that iCloud can be pretty slow. If you have large photo library, you should wait patiently for photos to load. It can also have limitations both in how many photos you can transfer at once, and what kind of photos are uploaded to the Cloud in the first place. Only 5GB iCloud storage is free. If you need more, purchase the plan. You need to upload and download photos instead of plug in and download, which causes time-consuming. Step 1: Simply plug your external HD and connect up your iPhone to your PC. 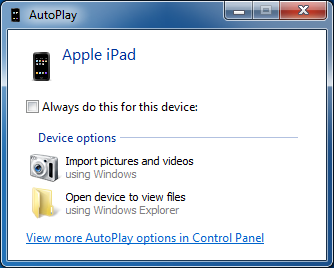 Step 2: Then, an AutoPlay window will appear. Click on Import pictures and video using Windows and then hit Import to take all images from the Camera Roll. Note: For Windows 10, you will need to go to launch Photos app instead, and use the “Import” button. You can then select photos. Step 3: Choose your external hard drive and hit Import or Continue to make transfer selected photos from iPhone to external hard drive. It doesn't support iOS 11 HEIC photos. You can't preview and select only some wanted photos to transfer. It just allows you to transfer all photos and videos at a time. You can't transfer photo albums from iPhone to external hard drive or computer. All you can transfer is photos. Photos in Photo Stream won't be transferred as well. Step 1: Connect both the external hard drive and iPhone to Mac in the first place. Step 2: Then, use Spotlight search to look for Image Capture, launching it. Step 3: Verify the name of your device, and all of the photos that it has on there will appear. Step 4: Click on Import To and select the external hard drive as the backup folder. Step 5: Select photos and then hit Import. If you want to transfer all photos, you can click on Import All. All the photos are shown according to date. That means you can't view or transfer the albums. Of course, photos in My Photo Stream won't be accessed or transferred. However, as with iCloud, this is slower, takes more work and has limitations as to how quickly you can transfer images from A to B. To make your life a little easier, you should look to turn to iMyFone TunesMate to transfer photos from iPhone to external hard drive instead. Compatible with both and easy to work with, this offers a friendly and simple solution for all.